Nuclear energy is the energy contained in the nucleus of atoms. 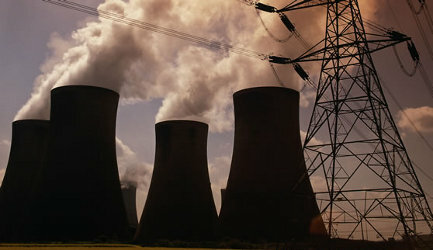 Nuclear energy is used in multiple applications (see applications of nuclear energy), but the best known application is the generation of electricity. The term nuclear energy is often used to refer to the electrical energy generated by nuclear power plants. One of the ways of harnessing nuclear energy is to obtain energy in the form of heat from the bonds that hold the nucleus of the atom together. There are basically two techniques for harnessing nuclear energy. Nuclear fision. Nuclear fission consists of splitting the nucleus of an atom (usually of uranium or plutonium due to its instability). Nuclear fusion. Nuclear fusion consists in uniting the nucleus of two atoms. Nuclear power plants are the installations responsible for obtaining electrical energy from nuclear reactions. These facilities contain, among many other elements, a nuclear reactor where nuclear reactions will be generated. Nuclear reactions generate heat energy that is used to drive turbines and generate electricity from the turbines. All installed nuclear power plants use nuclear fission to function. Nuclear fusion, for now, is only in the experimental phase. This website is a general information site on nuclear energy. The contents are focused on schematically explaining what nuclear energy is and how a nuclear power plant works. To understand it better, it is important to understand how an atom is formed. An atom is the smallest part that an element can be found. The atom is formed by a nucleus (composed in turn of neutrons and protons) and a cortex (electrons). We do not intend to enter into technical complexity calculations, sizing or any other engineering work. The use of nuclear energy has certain advantages and disadvantages. The main advantage is the possibility of generating a large amount of electricity at a relatively low cost with a small amount of nuclear fuel. On the other hand, nuclear power is not very popular due to the difficulty of managing nuclear waste and the possibility of nuclear accidents. In spite of the high security measures throughout the history of nuclear energy, there have been certain incidents and nuclear accidents. We will analyze how nuclear accidents are classified using the INES scale, and review the causes and consequences of the most important accidents in history ( Chernobyl, Fukushima ...). The authors of this website do not belong to any group related to nuclear energy nor do we intend to position ourselves in favor or against the use of this technology. This project is financed exclusively with the publicity of the web and there is no other entity of the sector behind us. Our objective is to explain everything that surrounds nuclear energy with maximum objectivity and simplicity: how a nuclear power plant works, type of nuclear reaction, advantages and disadvantages when it comes to generating electricity or a little history of nuclear energy.